Having escaped an abusive cult, Martha is living with her sister and trying to rebuild her life. However, while she is no longer a part of the cult, Martha is plagued by paranoia and struggling to identify her dreams from reality. Only one thing is certain, she has suffered psychological damage - and that damage is starting to show. 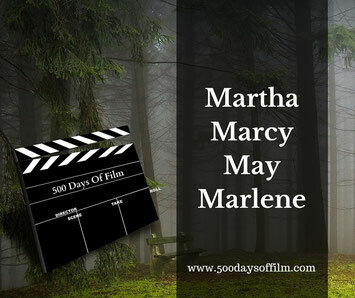 Martha Marcy May Marlene is one of those films where the less you know the better. All you need to know is that this is a brilliant and deeply unsettling film that features some superb performances. Elizabeth Olsen is fantastic and plays her role to perfection. John Hawkes (wonderful in Winter’s Bone) is, once again, brilliant. This is not an easy watch and there are a couple of disturbing scenes. However, the uneasy feeling the pervades this film lies at a more atmospheric level. I really enjoyed Martha Marcy May Marlene, but couldn’t shake the unsettling sense it left inside me - not for a long long time. Sorry that this review is so short. I am just wary of saying too much about a film that needs to be a surprise to work most effectively. Have you seen Martha Marcy May Marlene? What did you think about this film? I’d love to know - why not leave a comment in the box below? It's very unsettling. It has that haunting impact on the viewer that stays with you. Great central performance from Olsen. I completely agree, Dan! It certainly haunted me - I thought Elizabeth Olsen was superb. Hope she gets more challenging roles like this one in the future!